My family history research journeys are seldom linear. They often provide opportunity for side trips. Most recent, the culmination of almost a decade of stop-start-meandering. It got me thinking about family and friends who keep company with us on our life journey and at the same time are journeys in themselves. Families we are born to, friends chosen: guided to each other by our higher selves. Since I met the G.O. in 1990, he’s called me Ol’, short for Ollie. I mentioned this in Ollie & Vin, as part of the coincidence in the story of our house’s original owners. But that’s not the origin of the nickname I feel honoured to have. My part in this journey began with the nickname. Then the ring. In all the years I knew him, the G.O. 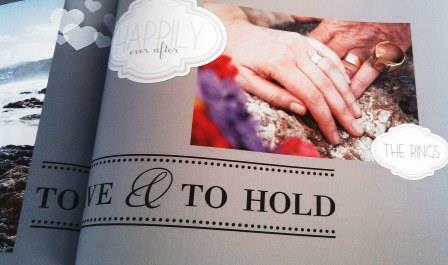 wore a gold ring on his left hand, married or not. I knew the ring was special though it was many years until the G.O. told me the story of it, and about Ollie & Rudi. The G.O.’s part of the story began in a 1960’s world that lingers only as a memory. Life was simpler and slower. What are nowadays expensive respectable inner west suburbs of Sydney were modest working class outer western suburbs. Neighbours knew each other and talked. Kids played on the streets. The G.O. was a wild child but not a terribly bad one. He was close to his family and good to them, befriended stray cats, dogs and people. Amongst whom were a neighbouring couple: Ollie & Rudi. Their story began even further in the past. Online records detail some of it. The G.O. recollects Ollie & Rudi talked about day-to-day happenings rather than the past. Especially not the war, other than a few fragments. Olga had been a translator. Rudi had refused to join the German Army, and had a previous partner from whom he’d been separated by the war; searching for her to no avail prior to immigrating. This part of their story is also part of Australia’s history. The Fifth Fleet is the name that I have given to the ships which, chartered by the International Refugee Organization (IRO), brought about 164,100 Displaced Persons from Germany to Australia after World War II, between 1947 and 1951… More came by ship and air during 1952-54. There was a total movement of 182,159 people up to the end of 1951–more than the number of convicts sent to Australia in the first 80 years of our modern history. It’s likely Ollie & Rudi’s first stop was Bonegilla Migrant Centre in rural north-eastern Victoria. Between 1947 and 1971, over 300,000 migrants from more than 50 countries called Bonegilla their first “Aussie home”. They arrived by train to Bonegilla railway siding where they were met, in the early days, by army personnel who provided transport, security and catering services… Bonegilla was the largest and longest operating reception centre in the post-war era. It was a place where new arrivals lived while they were ‘processed’ and allocated jobs. It was also a ‘training centre’ where non-English speakers could begin to learn the language and about Australian ways. Its intention was to help people make the transition to a new life in a new country. Between those years, in the late 1960’s Ollie & Rudi moved into the house next door to the G.O.’s family. The G.O. was a young teenager. They were middle-aged and had no children. Ollie later commented they had chosen between travelling the world and having children. In their travels they went to Indonesia where Rudi worked overseeing a factory owned by a friend. Ollie & Rudi spent a year tidying up the property and turning the overgrown yard into a garden. They didn’t have a lawnmower, so the G.O. lent a hand and the friendship was forged. After that first year Ollie & Rudi went to work: Ollie in an office at Burwood, and Rudi in the leather garment manufacturing industry. Before their retirement in the early 1980’s Ollie & Rudi moved to the Blue Mountains west of Sydney where they continued to be devoted to their garden, their dog Moystie & cat Mousie, and a tropical fish collection which from Ollie’s efforts became a thriving enterprise. Ollie & Rudi kept mostly to themselves, had a few friends including the grown up wild but not terribly bad G.O. for whom they set aside a bedroom in their modest house, and considered the son they never had. Rudi once confiding that in the early days Ollie had perceived the G.O. neglected by his working parents and wanted to adopt… or kidnap him! Ollie & Rudi remained close to the G.O., giving him the gold ring as a token of their affection. The G.O. continued to visit until one day Rudi rather than Ollie came to the door. That, and the look on his face conveyed wordlessly to the G.O. the terrible news. Ollie died on September 7th 1988, sitting at the table near the back step looking out at the garden. Rudi had been unable to bring himself to contact the G.O. to tell him. Prior to Ollie’s death Rudi incredibly received communication from his previous partner, and the amazing news that he had a son. Both of them were thrilled, however Ollie died before they could fulfil plans to meet. So the other news Rudi had to tell the G.O. was that he was returning to Germany. Therefore on a subsequent visit, the G.O. wasn’t surprised to find the house changed and Rudi gone. By 2005 when the G.O. and I started living together the gold ring given to him by Ollie & Rudi had worn thin. To preserve it I convinced him to let me take it to a jeweller and have a new ring made based on its design. The G.O. has Ollie & Rudi’s ring safely stored in my jewellery case, wearing the new ring -now his wedding ring- in its place as a legacy. At the time I had the ring made, conversation around it sparked my interest, and I discovered by telephoning Pinegrove Memorial Park which Rudi had mentioned to the G.O. as being where Ollie was cremated, that Rudi had collected her ashes rather than having them interred. This appeared to be the end of the story, yet something continued to niggle. From time to time I would Google search Rudi’s name in the hope of finding record of him in Germany. I checked again with Pinegrove Memorial Park, who had no details of Rudi. I searched online Australian Cemeteries Index. There were no matching records. I made a list of local cemeteries and memorial parks. Of them, on a gut feeling I telephoned Leura Memorial Gardens. After querying the various spellings, the woman who answered my call confirmed Rudolph Alois Stroher’s ashes were in row 7 of their Rose Garden, but they had no record for Ollie. And, anticipating further inquiries, that the arranging funeral director had closed its business. Suddenly, it seemed we were close. On the next Saturday events transpired for us to drive to the Blue Mountains to continue the search in person. Alas the outcome we anticipated wasn’t accomplished so easily. Within the Gardens there were few signs, lots of roses & rows which complicated the simple instructions to go to row 7 in the Rose Garden. The G.O. searched the whole complex without success. We left consoled knowing Rudi’s remains rested in pleasant grounds, we believe chosen because Ollie’s were scattered nearby at one of the scenic Blue Mountains places she so loved. On Monday morning, once again I called Leura Memorial Gardens, and spoke to a different woman, Kath, who reiterated what we already knew, clarified “there are several rose gardens”, and offered to check and get back to me. Later in the day she emailed me a map… it confirmed we’d walked directly to the correct location adjacent to the bridge over the chain of ponds, somehow missing Rudi’s spot. Later she messaged me from her phone several photos of the site, including a close up of the plaque “In Memory of Rudolph Alois Stroher, 5.5.1917 – 23.3.1998, At Rest”. We’ll make another trip to the Blue Mountains to properly pay our respects, and are very grateful for the assistance we received to finally also put our search to rest. With the advent of the internet and various ancestry and genealogy websites, depending on the depth of research you want to undertake, web searches can offer up information previously only obtainable via considerable effort, investigation and cost. Should you endeavour to undertake this type of research be prepared to get side tracked and spend endless time clicking on links and sources leading you to snippets of various information which do not necessarily exactly correlate necessitating the approximation and cobbling together of a story. And even if you think the trail has gone cold, keep searching and asking questions. I’ve found people are happy to help. With more material coming to light be prepared for revisions, updates and sometimes conflicting & varying information, spelling and versions. Don’t give up. This entry was posted in Blog and tagged ancestry, Australia, family history, genealogy, history, my life. In my short story Henry forgot to write “eat, eat” I wrote “There are ghosts in my kitchen. I know who these ghosts are. They are familiar to me”, and chronicled various family members who turn up from time to time. But there are ghosts who weren’t familiar to me. Ollie whose kitchen in fact it was until 1980, and her husband Vin. One of the wonderful things about Ollie is she isn’t pushy. It’s taken us a while to get to know her. It was only during our last visit to Taylors Arm earlier this month, chatting briefly to an ex-local, Peter, we became on a first name basis with our predecessors Ollie & Vin. Peter who by his surname is a relative of theirs, lived his early life in successive houses and was an apprentice baker in the village. He resided next door at the time of Ollie’s death in 1980. She died from a heart attack in the front bedroom. Our bedroom now. Our house was built in the 1930’s. We knew the first occupants by their surname only and were told they raised 8 children in our 3 bedroom house. As was common practice it also once had part of the verandah closed off as a sleep-out. Courtesy of Google I was able to find some of Ollie & Vin’s family history. Ollie & Vin were married in 1925. They both came from local families. Their various family names abound locally still. 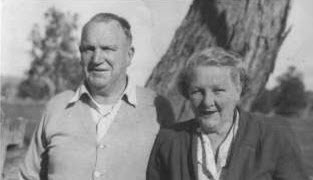 Ollie’s husband Vincent, 6 years older than her, died 6 years before in 1974. They were both 73 when they died. Although she was yet to be introduced to us, the G.O. and I had started to wonder about Ollie’s influence. Along with the many other old floral pictures we or our ghosts have a penchant for, we have in 8 years of our residence acquired several old religious pictures, starting with a simple small God Bless This House which cost a dollar. Both the G.O. and I have Anglican family heritage but the pictures we’ve acquired are quite Catholic, Ollie & Vin’s religion. To this day, they and their family’s names appear in the weekly parish bulletin under “Praying for Holy Souls”. As I imagine they were regular church-goers, the Catholic Church conveniently for them is one house up from ours. It’s the church we attend at Christmas & Easter but all, regardless of denomination, are welcome any time. It’s the local church. Only days before my chat with Peter the G.O. 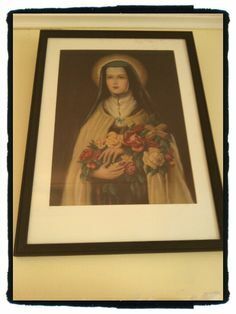 surprised me with several gifts for my birthday, one of which was a print of (I now know) Saint Therese. The gift was a surprise because I had been mulling over its purchase for a while. When we were in Macksville en route to TA I went to the shop to buy it but there was only an empty hook on the wall. Somehow sometime the G.O. bought & got it home without my knowledge. Our St. Therese now resides over the kitchen door, flanked by flowery renditions of The Lord will Provide and The Lord is my Shepherd. As the G.O. hung St. Therese in place on the Saturday, we wondered about the original owners of the house and if this was their influence. Our suspicions were confirmed the next morning. When the G.O. joined Peter and I in conversation and was told Ollie and Vin’s names the expression on his face must have echoed mine. Since I met the G.O. in 1990, his nickname for me has been Ol’ short for Ollie, and his pseudonym in my short story Reprise is Vin, named for Vincent, his grandfather. This entry was posted in Blog and tagged ancestry, Australia, genealogy, house history, inspiration, my life. I share a love of Trove* with Metan of Buried Words & Bushwa. Metan posts about quirky historical newspaper articles, I trawl through Trove for family history snippets. Trove came to the rescue last week, during a Facebook discussion within the Murrurundi Memories group. GC: how could Mr Abbott be Miss Button’s brother? EllaDee: Miss Button was Emma Button who was my great, great, aunt. Their residence was next to the Royal Hotel. Hopefully this link will work http://trove.nla.gov.au/ndp/del/article/82774246** Harry Button was my great grandfather on Dad’s side. Uncle Mark had the dry cleaners in Scone but he is buried in Murrurundi Cemetery. I have & treasure 2 paintings done by Emma in 1911. A popular figure in sporting circles, Mr. Arthur Trevor Button, of John Street, passed away at the Dangar Cottage Hospital yesterday afternoon. Mr. Button suffered a heart complaint which forced him to relinquish his saddlery business last year. Born in Murrurundi 69 years ago, the son of the late Mr. and Mrs. Walter Button, of that district, he came to Singleton about 1907. Settling here, he served his apprenticeship as a saddler with Mr. Milton Frith. Several years later he set up his own business in the town. In his early days he was a keen sportsman and prominent athlete, and these interests persisted up until the time of his death. Mr. Button is survived by his wife. Mrs. May Button, and leaves a daughter and four sons. 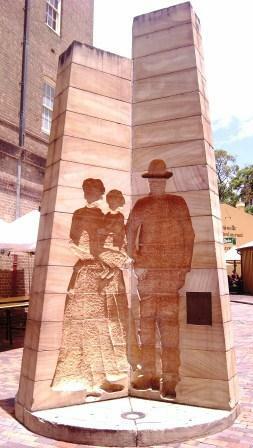 They are Audrey (Mrs. R. Campbell, of Singleton), Rodney and Mervyn, Singleton, and Arthur and Easter, of Nowra.Mr. Button is also survived by three brothers and sisters. They are Fred, of Wentworthville, Harry and Mark, of Scone, Lil (Mrs. Hocking), Dosie (Mrs. Gordon) of Enfield, and Miss Emma Button, of Murrurundi. After a service at All Saint’s church this morning at 11 o’clock, the late Mr. A. T. Button was laid to rest at the Church of England Cemetery, Whittingham, where the last rites were performed by Canon W. Holmes. Messrs. H. J. Bartrop and Son carried out the funeral arrangements. EllaDee: Emma’s other brother Harry (my Poppa Button) was also in Scone, he was a tailor. It was so very special to hear these great memories of Aunt Emma (b. 1890), who I don’t remember, although I knew and was very fond of Uncle Mark. My post art of the heart mentioned Aunt Emma’s paintings. “The paintings came from my grandparent’s farmhouse living room. 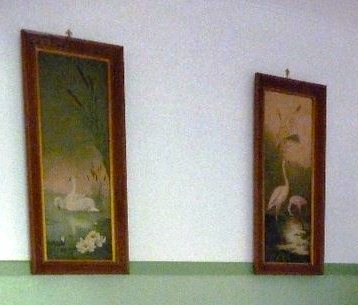 From 1975 – 2010 they adorned the walls of my uncle & aunt’s living room, with me uttering very quietly to myself upon seeing them, “I’d wish I’d chosen those”… but at 9 years old, I chose a tall blue & purple vase which is still mine, and would be the first item I grabbed if I had to evacuate. Genealogy for some can be almost a science. Not me. Random thoughts and ideas pop into my head and translate via my fingertips into Google searches. The online world is a wonder for a family history butterfly… I flit from tree to tree gathering the remnant bits and pieces and colour of lives before mine. *Trove is the National Library of Australia’s home “of over 342,775,686 Australian and online resources: books, images, historic newspapers, maps, music, archives and more”. This entry was posted in Blog and tagged ancestry, Australia, family, family history, genealogy, my life, social media.